We would like to take this opportunity to thank you for considering a fishing charter on the Lady Grace V. We encourage you to come aboard and experience the thrill of Montauk Sport Fishing. Sailing out of West Lake Fishing Lodge, the Montauk Charter Boat Lady Grace V aims to provide the best possible service to enhance your sport fishing experience in Montauk, the fishing capital of the world. If at any time we can be of assistance, please feel free to contact us directly. We once again thank you for selecting the Lady Grace V and look forward in serving you in the future. Gift Certificates available! Contact Captain Mario for more information. Wow! What a great day on the water. 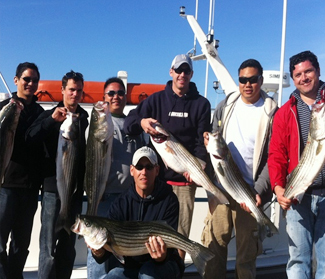 My brother-in-law and our 6 boys combined decided to try some Montauk fishing on a charter boat. We were recommended to Lady Grace Charters by a friend. I can’t thank him enough. We had an amazing time. I wanted badly to catch a Montauk stripe bass but I thought a fluke charter was the way to go with some of the young men we had in tow. We ended up doing a bit of both and every person on board took home a keeper. Including my first 40lb striper. I can’t wait till next season. Thank you Lady Grace for an unforgettable day with my boys and nephews. 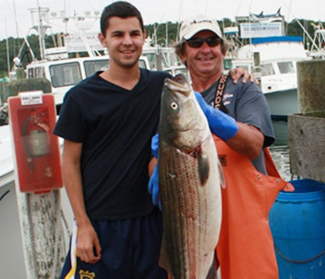 Once again, another superb day on the Lady Grace with Montauk’s best charter boat Captain. I truly am astounded how I bring home fish every time I’m on the Lady Grace charter…even when others are not. I have brought many of my family and friends back year after year and each time its been a wonderful experience. 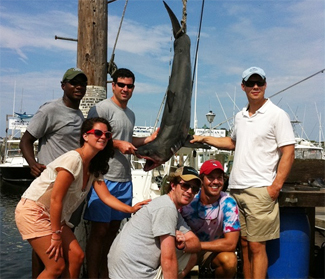 If you are looking to do some sport fishing out in Montauk – Lady Grace is the right choice. Next year we will be scheduling two different trips. Looking forward to scheduling the Tuna Charter and the Stripe Bass Charter. Cant wait till next year. Thanks again for another superb day on the water. I can’t thank you enough for the wonderful day of shark fishing. The Lady Grace charter boat was more than we expected and it was a great bonding experience for my entire sales team. I was impressed with all the gear that you had and it was a pleasant experience not to have to worry about a single item that was needed for the tirp. It was a pleasure having someone so capable and experienced in charge. We plan to try the bluefish charter next year. Copyright © 2019 Lady Grace Charters. All Rights Reserved.